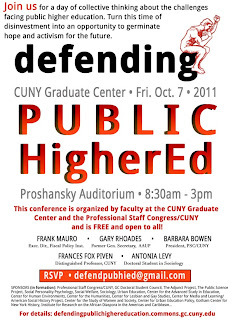 We are writing to ask assistance in publicizing a conference entitled, Defending Public Higher Education, that will be held at the Graduate Center on October 7, 2011. Many of us have witnessed first-hand the consequences of state disinvestment in public higher education over the past three decades. Most American public university systems, such as California, Wisconsin, and Illinois, have had dramatic cutbacks in academic programs and student services. Here at the City University of New York (CUNY), we have gone from a tuition-free system as late as 1976 to one that receives over 45% of its operating budget from student fees and tuition. The percentage of the operating budget covered by tuition and not public investment is expected to grow over the next five years as a result of tuition increases structured into the state budget. 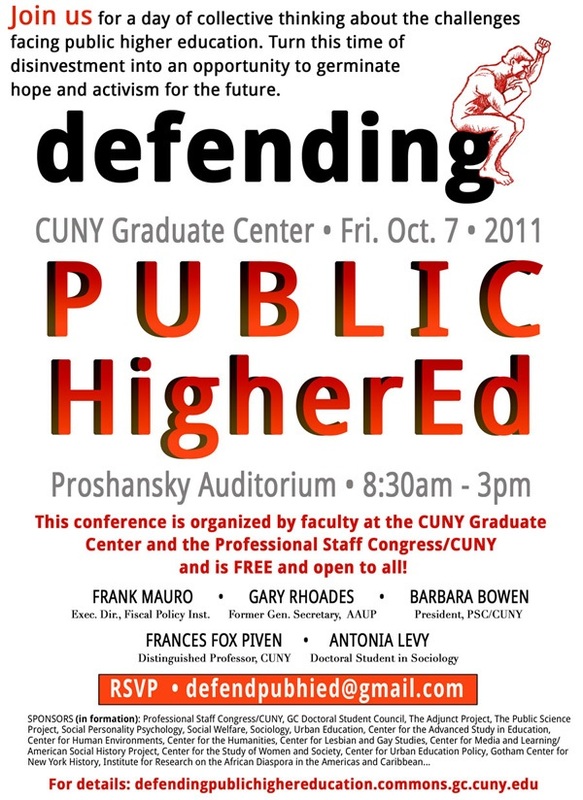 At the conference, we will be discussing these and other issues especially salient to the growing crisis of public higher education and more specifically to CUNY. Thank you for your help and if you have any questions, feel free to contact one of us.